With the increasing mainstream adoption of big data infrastructure -- highly distributed file storage and query tools -- more businesses are taking a new look at what business intelligence and analytics can do to grow revenue, increase profits and ultimately develop strategic relationships with customers. 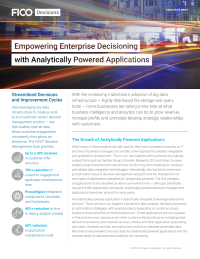 An analytically powered application is specifically designed to leverage data-driven services. These services can support a business’ data analysis, decision processes or optimization strategies, with varying outputs depending on customer inputs, business-driven priorities or desired outcomes. As data, and particularly real-time customer-generated data, becomes more prevalent, the use cases for analytically powered applications and the ultimate desire to operationalize analytics are increasing. Download this executive brief to learn how your enterprise can start leveraging any data infrastructure to create an end-to-end customer-centric decision management solution with the FICO Decision Management suite.